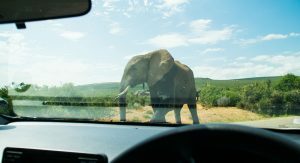 On paper, driving between Cape Town and Durban, two of South Africa’s most populous cities, seemed like a walk in the park. As it turned out, this roadtrip tossed up more than a few twists and turns. 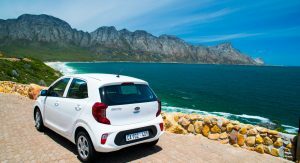 The journey started in early January after picking up a Kia Picanto from a Cape Town rental car company. 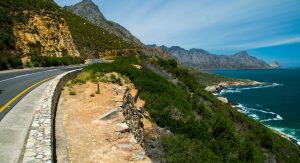 With a rough itinerary, I began the journey to Durban via Cape Town’s absolutely stunning Garden Route, the country’s equivalent of the Pacific Coast Highway in the U.S. or Australia’s Great Ocean Road. 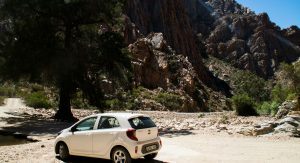 The Kia Picanto is not the ideal car for such an adventure. Measuring just 3.5 m long, 1.5 m wide, 1.48 m high, and with a wheelbase of 2.4 m, it is a compact city car in the truest sense. 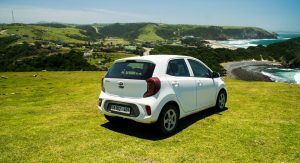 What’s more, with a compact 1.0-liter three-cylinder engine delivering just 68 hp at 6200 rpm and 70 lb-ft of torque at 3500 rpm, the Picanto could easily feel out of its comfort zone at any speed above 100 km/h (62 mph) and in areas not dominated by soaring skyscrapers and over-crowded streets. 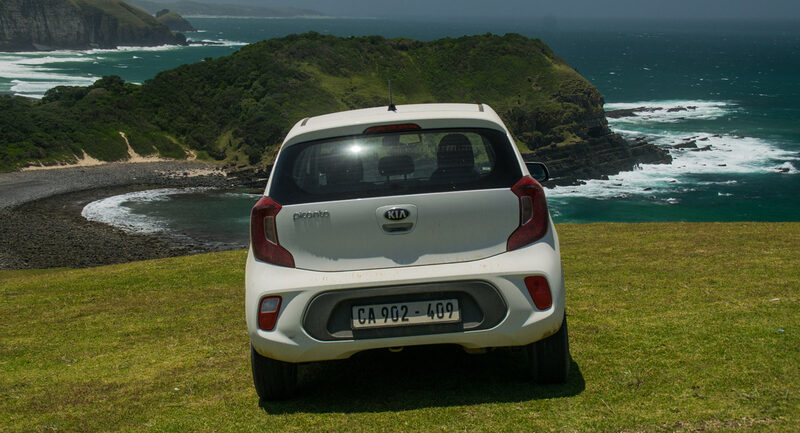 Much to our surprise, there is much more than meets the eye with the little Kia. 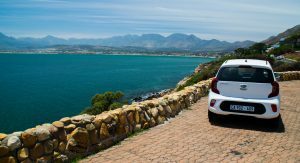 The first day of driving involved dawdling along the coast from Cape Town to Gansbaai, a town known as the Great White shark capital of the world. 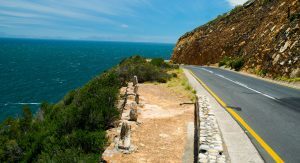 The Garden Route is perhaps the continent’s ultimate must-do roadtrip and almost immediately after leaving Cape Town, it’s easy to understand why. Journeying along beautifully-smooth coastal roads, we were presented with sweeping ocean vistas to one side and exposed rock faces to the other. 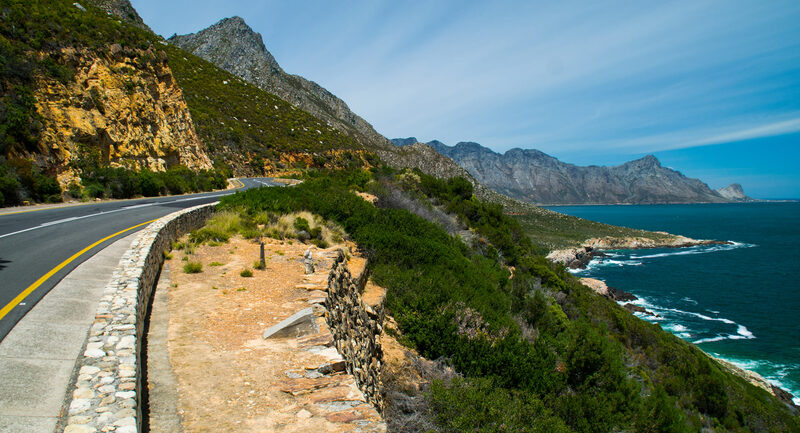 Chapman’s Peak Drive was certainly the highlight, complete with views to rival those of the French Riviera. It’s a shame then that this glorious location was offset with a tinny and almost unbearable sound screeching out of the Picanto’s speakers. Like any proper roadtrip, a soundtrack equally as addictive as the views is a must. But it appeared all hope was lost when I connected my phone via Bluetooth to the car’s simple infotainment system. Bummer. Time to buy a portable speaker, I thought. Not so fast. 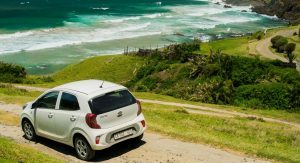 By turning the bass, middle, and treble tones to their maximum settings, the Picanto’s sound system becomes somewhat bearable. Next, I started messing with the equalizer on my phone and discover that, with the right settings, I had a rolling concert hall on wheels. Well, that may be an overstatement, but still, for a car of this price point, it’s a decent effort by the South Koreans. 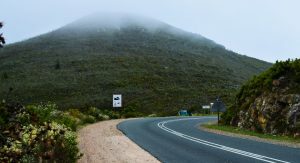 Following an overnight stay in Gansbaai, the drive in-land towards Swellendam began. For the most part it was uneventful, but did offer the perfect chance to see how the Kia operated on long stretches of open highway. 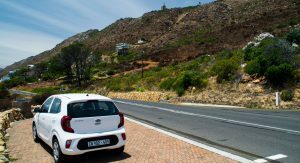 Many speed limits in South Africa sit at 120 km/h, a figure that took painfully long to reach with the 1.0-liter Picanto. 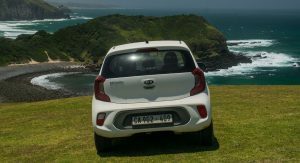 Once at 120 km/h, you’d better hope that there are no strong winds around, as the tiny Kia doesn’t cope very well with them. In calm conditions, however, it feels very planted at highway speeds. All 900-odd kg of it. Another breezy afternoon and night were spent meandering around before the road trip commenced once again, this time in the direction of Oudtshoorn. 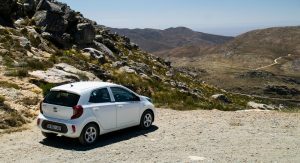 While near Oudtshoorn, I figured it was time to see how the Picanto performed on gravel. As we’ve all heard, rental cars are supposed to be the best rally cars. 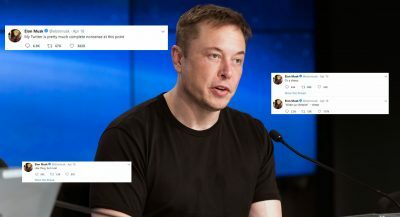 Did this hold true? 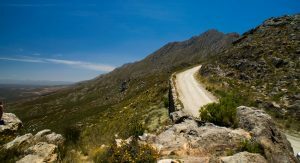 Between Oudtshoorn and Prince Albert, there is a truly jaw-dropping ribbon of gravel road dubbed the Swartberg Pass. The road, consistently just wide enough for one car, is like a piece of spaghetti draped through the heart of a canyon. 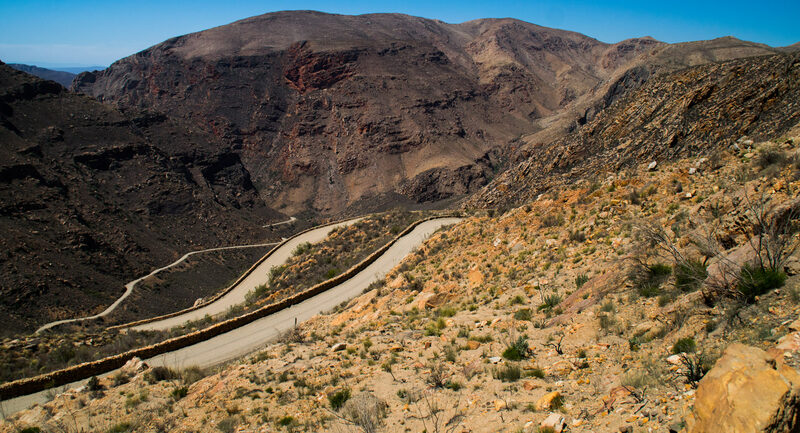 It is surely worth a mention in any list ranking the best mountain passes. 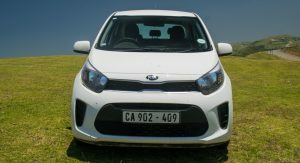 It may not have been paved, but the gravel was smooth and brought out the very best of the Picanto. Despite the Kia rolling on skinny 165 mm section tires, it is void of almost any understeer, even when pushed into corners at moderate speeds. 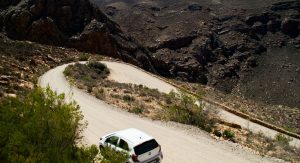 Instead of pushing sideways on turn-in, the car is actually prone to oversteer and even the slightest steering input on a straight stretch of gravel road saw the rear end begin to give way. With a touch of opposite lock and a blip of the throttle, it was easy to control. 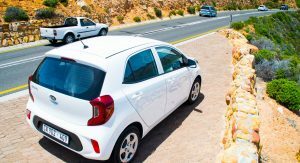 Surprusingly, somewhat impressive powerslides can even be performed – not something one may expect from an affordable city car. With an overnight stay in the beach town of Knysna fast approaching, I was left with a decision. One option was to backtrack south-west along paved highways to the town of George and then south-east along the coast. 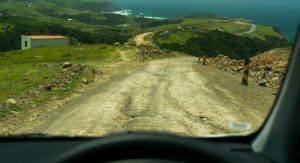 Alternatively, I could do the dim-witted thing and drive directly south from Uniondale to Knysna, along a pothole-ridden gravel road zig-zagging its way roughly 90 km through deserted mountain ranges. I took the second option. 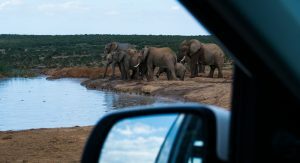 The 90 km drive took approximately two hours and, on the way, I saw a grand total of one other car. Fittingly, it was an indestructible Toyota Hilux. For the rest of the time, it was just me and the Kia covered in a thick layer of dust. And then it started raining. ‘This could get interesting’, I thought. With my fingers crossed, I was left to drive along a thin road in the middle of nowhere with rain peppering the mountains and sunset soon approaching. It was a recipe for disaster. Yet, somehow, the Kia made it with nothing more than some bugs splattered across the front-end. 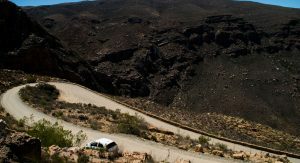 No punctures, no visible stone chips and not a single close-call, despite oftentimes treating the road as a rally stage. The Picanto was starting to win me over. Is there anything this car can’t do? 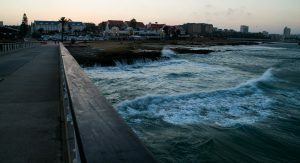 Over the following four days, Google Maps continued to direct me along the Garden Route, passing through peaceful towns like Storms River. For the most part, the driving was straightforward and the Kia continued to soldier on, despite my inkling to often take the longest route possible in an effort to find more gravel roads to slide around on. 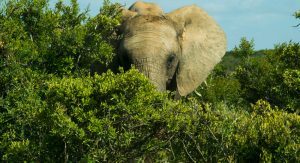 Fast forward a couple of days and I found myself in the heart of Addo Elephant National Park, just north of Port Elizabeth. 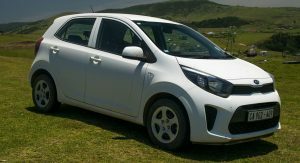 Since picking up the Picanto, it was impossible to ignore just how small it was. 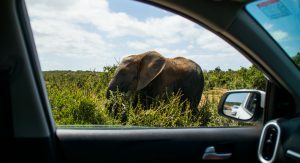 However, it wasn’t until I was within touching distance of wild elephants three times of the size of the city car that I realized just how tiny it is. 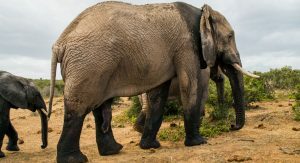 Despite their size, elephants are largely very calm animals. 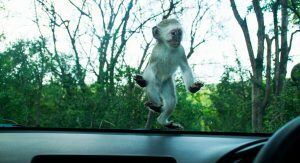 However, the thought of one accidentally mistaking the white Kia for a small fruit tree and crushing it did cross my mind. 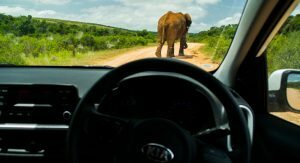 In everyday driving, this scenario is not something Picanto owners will experience. However, when driving around, particularly on large highways, it is hard to feel entirely safe and secure in a vehicle of this size. Indeed, it is hard not to drive around with white knuckles at highway speeds as fast-moving trucks rocket past you in the opposite direction. 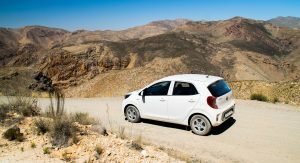 By now, it was becoming obvious that the Picanto is somewhat out of its comfort zone on long highway drives. Another disappointment is the lack of cruise control. For a car of this sort, the absence of such a feature isn’t a surprise, but it is dearly missed nevertheless. The three-cylinder engine is also woefully underpowered and makes highway driving a nuisance. 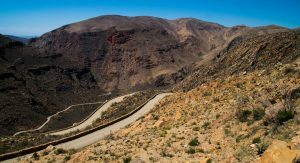 At even the slightest uphill gradient, you’re forced to at least change down to fourth gear and pin the throttle in order to maintain a consistent 120 km/h. If the hill is quite steep, a change down to the incredibly-long third gear is necessary. 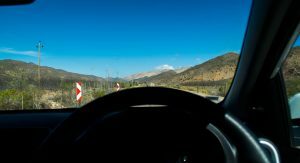 Even then, it can be difficult to not gradually lose momentum, eventually dropping from 120 km/h to 110 km/h and sometimes even below 100 km/h. 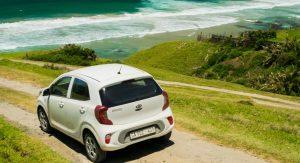 So, you can forget about relaxing highway miles in the Picanto. If you don’t want to grind to a halt, you’ll be constantly shifting between the gears and adjusting throttle inputs depending on the topography. 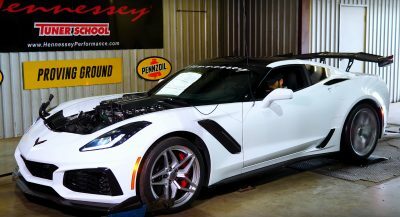 A larger engine, perhaps a 1.2- or 1.4-liter, wouldn’t go astray. And please, don’t even get me started on luggage space. A 60-liter backpack and 30-liter bag only just fit in the trunk, making the car useable for precisely one vacationer. 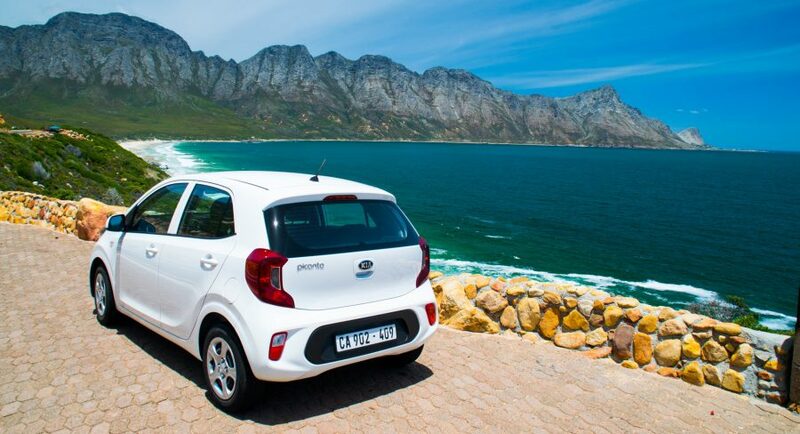 With two, or even three occupants, the Picanto is simply too small to bring their baggage along. 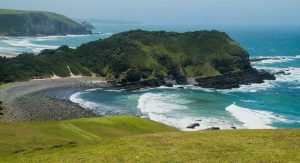 For the latter third of the roadtrip, I headed through South Africa’s stunning Wild Coast region, an area dominated by rivers, blissful beaches, and sheer cliff faces that drop into the ocean. 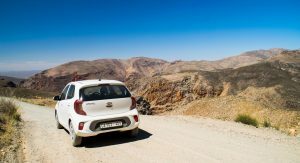 With yet more gravel roads, it proved a test for the Kia but was dealt with in excellent fashion. Somehow, the car had survived. 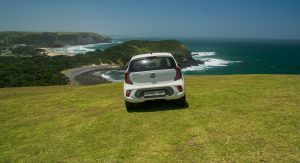 Seemingly as abruptly as it had started, the journey ended in Durban, marking the end of 15 days of driving through some hugely difficult terrain. Few of the Kia’s downsides should surprise you and they are hardly new revelations. 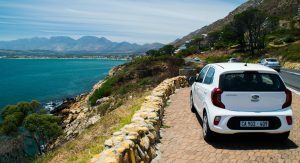 At the end of the day, the Picanto is a city car first and foremost. However, after spending so much time with it, I came to a realization. 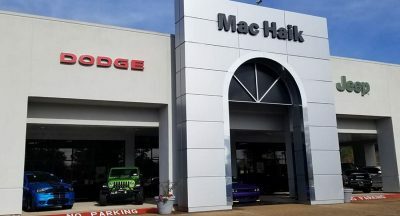 As car manufacturers look to fill every niche imaginable, it is easy to think that vehicles are good at nothing more than what automotive marketing agencies say they are. For example, a mid-engine supercar is far more than simply a supercar nowadays, it can also be a comfortable GT car that can be driven across continents. 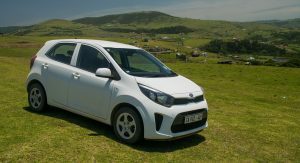 Likewise, a city car, like the Kia Picanto, performs valiantly outside the confines of a city and, for the majority of car owners without a family, provides everything you could need. 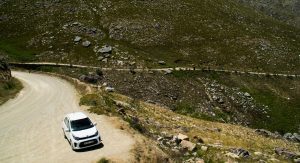 The fast and light steering, coupled with its tight turning circle, provide excellent agility not just on narrow city roads, but on curvaceous mountain passes, too. 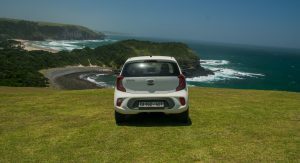 There’s little feel through the steering and the brake pedal can be very sensitive, but, for the most part, it is just as you’d expect from the resurgent South Korean carmaker, plus a little more. 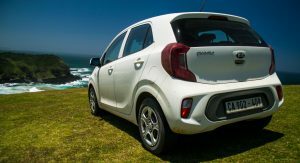 If you’re in the market for a city car, do yourself a favor and put the Picanto at the very top of your list. 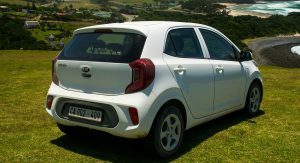 After tried the Picanto Turbo and Up TSi, I would never ever go back to an N/a 1-liter car! More articles like this, please! They’ll have to fire some members of their staff and hire new ones for articles like this to be consistent. One of which being the fanboy who I know is waiting for Abu Dhabi Motors to update their Facebook page. 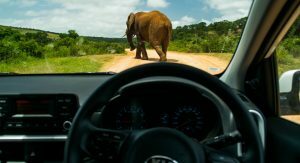 I’m sure glad that photoshoped elephant in image 44 and 45 didn’t attack that Kia. 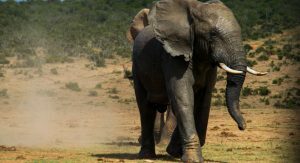 I still think the elephant looks ‘too real’ for the setting. 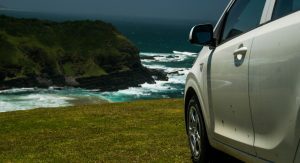 Oh what a beautiful coastline..
Me too, i have relatives their, and i love the Picanto too. I can tell you now…this is easily article of the year. A great write up!